it's either a positive or a negative that the festive holidays encourage a total disregard for the usual sequence of days. in the working week, deadlines, meetings and tasks pretty much demand attention to detail, but when there's simply no need to be anywhere or do anything according to a pre-determined schedule then it's oh so easy to lose track of any sort of time. these are the very days when an apple watch would seem completely superfluous, were i even to own an iphone to match. and the weather varies remarkably little: each end of december day last year looked pretty much like the one preceding. grey, rainy and windy. so you will perhaps excuse if i cannot recall on precisely which day i poured into debbie's a smidgeon on the damp side. there was a couple sat on the leather sofa, confronted by half-empty coffee cups, smiling sympathetically at my bedraggled plight. "why," i was asked, "don't you just wear one of those yellow cycling capes?" considering the strength of the wind from which i was taking refuge, i believe my answer revolved round the contention that, such being the case, somebody would presently be required to collect me from tiree, an island some considerable number of miles to the north. thankfully, garment technology has moved us on from such days. i can remember watching a tv programme from many years ago when singer/comedian mike harding embarked on a british cycle tour on which he immediately donned one of the aforesaid cycling capes at the first sign of precipitation. but much like umbrellas and full length raincoats, these are scarcely items that are of much use in the hebrides. and i'm pretty sure that a peloton fighting the crosswinds experienced in last year's gent-wevelghem would have made it past the neutralised zone if dressed in yellow cycling capes. nowadays, in the majority of outdoor activities it's all about layering and breathable fabrics. however, i think it likely that the majority of us have come to the conclusion those breathable waterproofs rarely breathe at a rate commensurate with our propensity to perspire. 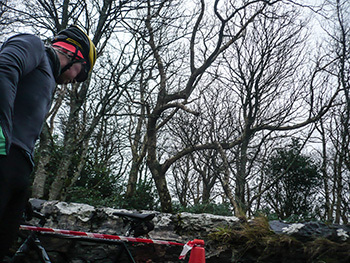 it's a very fine line between keeping the average cyclist dry on the outside as well as the inside. common thinking has thus arrived at the point where, within the limitations of current garment technology, neither are 100% possible. so the very best that can be achieved is maintaining warmth and comfort when we eventually get wet. 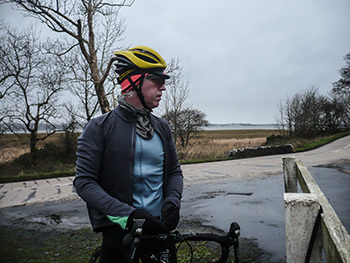 such is the philosophy behind rapha's second edition of their pro team softshell jacket, now utilising a polartec power shield pro fabric that is purportedly more effective than the first edition of the jacket released around this time in 2014. in an effort to clarify the difference, i spoke to rapha's head of product development and r&d, simon huntsman. for surely if the improvements were predominantly cosmetic, there was little point in my scheduling a further review? 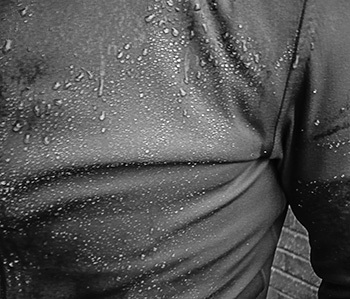 while confirming that applied durable water repellency (dwr) coatings are not all created equal, simon outlined the procedure rapha employed to evaluate the materials used in the softshell jacket. "We weighed each version of the jacket, prior to sending a poor unfortunate volunteer out to ride in some lousy weather. The jacket is then weighed once more on its return to determine how much water the fabric has absorbed. Obviously the lower that number, the better. but we're also interested in the fabric's thermal properties as well as its breathability." we've all enjoyed the sight of precipitation forming little droplets on the sleeves and jacket front, before rolling off harmlessly onto the bicycle or the road. however, there comes a point for every fabric or dwr, when that process begins to suffer from saturation, and the jacket begins to absorb water. every breathable jacket will eventually reach a point where it's absorbing more water than it's shedding. that's when we get wet inside. 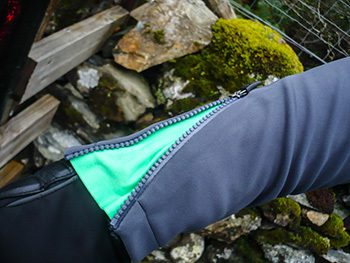 how long that takes and how comfortable and warm it can keep the rider when that happens is currrently the holy grail of waterproof garment technology. 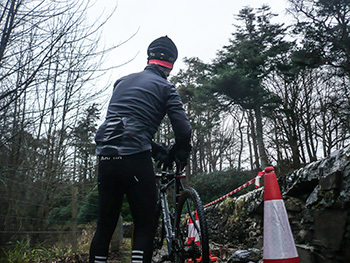 last years' pro team softshell was a delightful fire-engine red, a colour that has almost tangible properties when it came to highlighting my existence on the road. 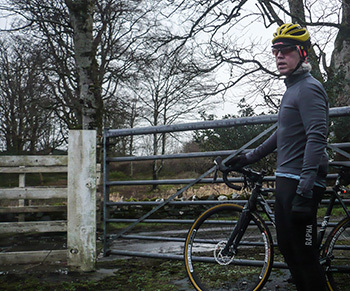 for reasons i cannot determine, rapha have dispensed with such visibility in favour of mid-grey or black options. the item reviewed was of the former colour and though very stylish, i'd still have preferred the red option. but apart from the colour change, you'd be forgiven for recognising very little similarity between the latest version and its predecessor. gone are the laser-cut holes on the the armpits, a feature that surely gives credence to an improved level of breathability. however, all the seams are still fully taped. added, however, is a feature that i think ought to become as compulsory on a long-sleeve jacket as the ubiquitous additional zipped rear pocket; zipped gussets at the cuffs. though these can prove reasonably effective as ventilation, their strength lies in the ability to zip the cuffs over the top of a pair of gloves. considering how clumsy a process this can usually prove to be, i would like to initiate a campaign for zipped cuffs to appear on everybody's long-sleeve waterproof jackets. that apparently gimmicky plastic-coated central rear pocket is not only still there but, in fact, remarkably effective. my velocipedinal accompaniment for the festive 500 was bereft of mudguards, so that coating protected several slices of mrs washingmachinepost's christmas cake from unbridled sogginess. there are a total of three rear pockets plus the aforementioned zipped security version. the fit of the jacket also seems to have undergone a beneficial renaissance; the first version was a very close fit, while the latest softshell appears to be less restrictive, yet has gained a few brownie points on the overall fit stakes. however, all the above are just so much window dressing if the jacket fails to perform to its avowed reputation. it will surprise you not one whit that those 500 festive kilometres brought new meaning to the phrase 'wet and windy'. the softshell offers almost unparalleled windproofing and initially performed very impressively in wind-driven heavy showers. the worst that happened to the micro-grid lining was the absorbing of moisture from a pair of soaking wet pro-team bibtights, a factor that would undoubtedly affect any make of jacket and only on the lower portion. 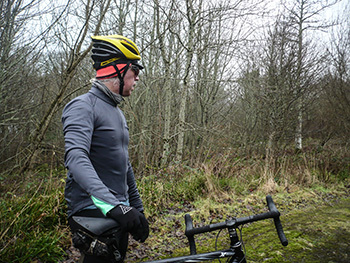 i rode day after day with the jacket over a s/s merino baselayer and long-sleeve jersey. and just so's you know, it comfortably fits over a sportwool jersey as well as the recommended pro-team polyester variant. 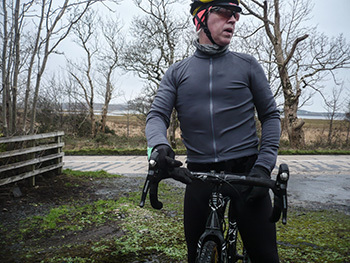 on the penultimate day of my festive 500, after fending off showers all morning, i got caught in two hours of heavy, persistent rain and i did, in fact, become soaked right through to that baselayer. i'd to empty water from my shoes on returning home. however, i figure that the jacket fulfilled its promise, for despite sub-zero windchill, i remained comfortable enough to ride home unhindered. in weather conditions such as those, i fully expected to get wet; all jackets have their limitations. but the deciding factor, for me at least, was having retained a core temperature that allowed me to ride a total of 91km in relative comfort. simon huntsman did point out during our conversation that it is possible to ruin the dwr coating by washing with the wrong detergent, not unsurprisingly recommending rapha's apparel wash. however, mrs washingmachinepost has cleaned the softshell twice using only non-bio powder and it appears to have suffered no ill effects. 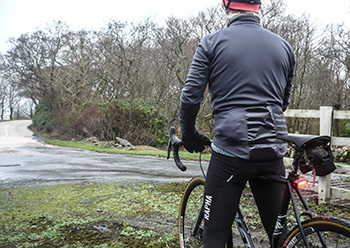 the pro team softshell is arguably the current state-of-the-art, though i've no doubt that technological development continues apace, meaning that i might well be saying the same thing about a newer jacket this time next year. meanwhile, this will do very nicely, thank you, but could i have a brighter colour please?